When considering what foods to buy, more consumers are seeking products that cater to a balanced diet. In fact, when given the choice, 59% of consumers prefer to ‘eat clean’ and are more likely to purchase foods that are less processed. Today consumers are demanding greater access to whole foods such as fruits and vegetables, ancient grains, and plant-based proteins such as nuts and seeds. Canadian agricultural businesses must be conscious of these emerging trends and adopt strategies to target global food preferences. This means that food producers will need to think of ways to modify their products to meet today’s cultural and societal standards. Fortunately for Canadian agri-food businesses, Canadian government grants and loans are available to help develop new products catered to the evolving tastes of both domestic and export markets. When used effectively, these programs can help food companies become more proactive in adapting to market trends. Current global food preferences indicate a demand for healthy food options that support ‘clean eating’. To eat clean and follow a balanced-diet, consumers are looking for foods that are minimally processed and as natural or organic as possible. Today, Canadian food producers/processors are still generating foods that are relatively unhealthy. To access a larger portion of the global health-conscious market, food businesses must diversify their product offerings. To sustain future profitability, food producers and processors should provide better access to protein-rich, GMO-free, low-sodium, and sugar-free products. Why are Global Consumers Demanding Healthier Foods? Consumers are demonstrating a slower and more thoughtful approach when it comes to their eating habits. The adage “you are what you eat” is a primary focus for many global food consumers, so providing options that support a healthy lifestyle is significantly important. What Does This Mean for the Canadian Agriculture Industry? Recent clean eating trends are forcing businesses to consider new, strategic ways to target global food preferences. Canadian agri-food businesses must identify ways to offer nutritious products that support a well-balanced diet. To do so, food producers/processors will need to enhance and/or increase their product offerings to meet this global trend. Whole foods, including non-genetically modified and/or anti-technology products. NSERC Engage is a collaborative research and development program that catalyzes industry-post-secondary partnerships that seek to solve an innovation challenge. Canadian government funding can be used to help businesses access university technical talent, labs and testing facilities, and equipment to support the project. Agri-food businesses can access the program to assist with short-term (4-6 month) R&D projects that explore healthy product options. Applicants can access up to $25,000 in research and development grants to address a specific industry challenge or knowledge gap. Research partners may be eligible to access additional funding extend an on-going R&D project. NSERC Engage Plus allows businesses to access an addition $12,500 in grants extend a project with the same professor for up to six months. In addition, NSERC Collaboration Research & Development (CRD) supports the extension of projects timelines by an additional 1-5 years and will provide up to $150,000 in funding per year. Agri-Marketing’s Market Development stream provides small business grants to help growth-oriented companies increase export revenues. Canadian government funding helps small and medium-sized businesses reduce international trade show participation and strategic export marketing costs. Ideal projects help agri-food businesses expand their presence and competitiveness within domestic and global markets. Eligible applicants can receive up to 50% of project costs to a maximum contribution of $50,000 in export marketing grants per year. In Ontario, Canadian food producers and processors can access business expansion programs such as the Southwestern Ontario Development Fund (SWODF) and the Eastern Ontario Development Fund (EODF). These programs provide Ontario government funding to reduce the cost of large-scale business investment projects such as facility and equipment upgrades. Agri-food producers/processors can access small business grants to improve productivity, increase capacity, and create new jobs. Projects Under $10 Million: Up to 10-15% of project expenses to a maximum $1.5 million in Ontario small business grants. Projects Exceeding $10 Million: Up to 10-15% of expense coverage to a maximum $1.5 million in grants, plus the option to receive up to $3.5 million in repayable funding. Businesses across Canada can apply for government grants and loans to offset strategic projects and investment costs. Throughout the year, business owners and executives may use funding to improve their productivity and global competitiveness. 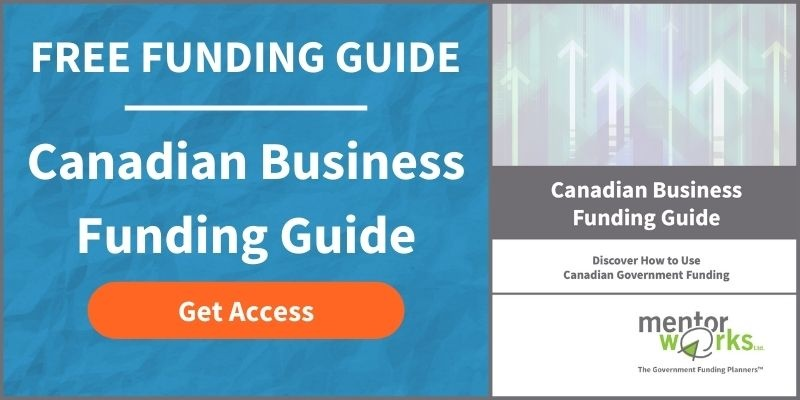 Download the Canadian Small Business Funding Guide to get started with government funding and understand what types of projects are most suitable for government incentives.